Drive was approached by the South West Heritage Trust to create a short biographical video about Doris Hatt, an extraordinary early 20th-century artist. This film would complement an exhibition of her modernist art held at the Museum of Somerset to commemorate the fiftieth anniversary of her death. It was important to convey in the video that Doris was a woman ahead of her time. Developing her vivid artistic style in tune with the major themes of the early 20th century, she was also a brave political and social activist, as a member of the Communist Party and the suffrage movement. We therefore ensured the film was visually stimulating and uplifting, while at the same time factual, incorporating major historical events of the period that shaped Doris’ life. This was achieved by sensitively combining her colourful artworks with archive clippings, bringing this imagery to life through subtle movement and the separation of her works into layers. 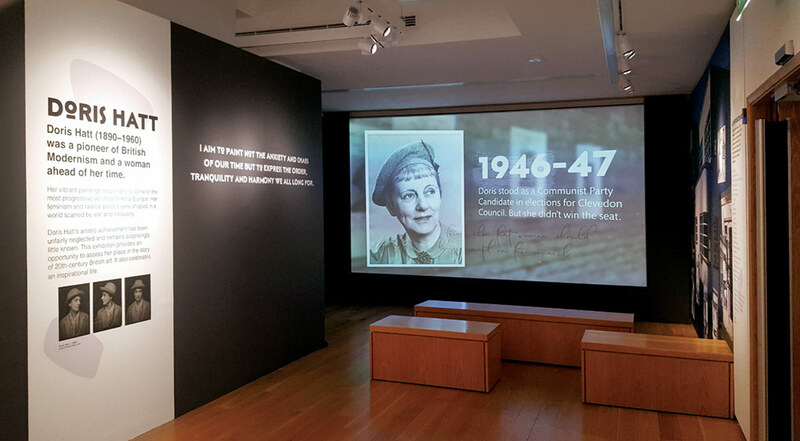 The narrative was provided as a voice-over accompanied by graphic subtitles throughout – ensuring that the video was social media friendly, while further providing the exhibition space with the flexibility to run the animation with or without sound when projected into the exhibition space. On completion, we created social media excerpts for South West Heritage to use across their social channels. The resulting five-minute animation is an engaging visual celebration of early 20th-century artistic and social movements, as well as a fitting legacy to this brave, talented and remarkable woman’s life.